Please check out the Media page for a link to the interview. 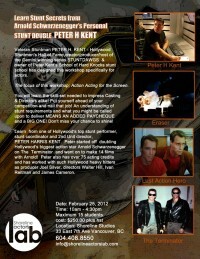 Please check out the Stunt School page for more details. There are also a lot of new links on the Media page - Peter has given a lot of interviews lately. Peter will be a guest at GalaxyCon in Düsseldorf on September 6-8. Please check out the convention page for more details. Peter has been invited to show his movie Superheroes Don't Need Capes at the Sundance Festival 2013 (January 17-27). It's a 60 minute drama about bullying and in addition to playing the father of the Cole character, Peter also acted as associate producer, co-wrote the script and directed 2nd unit. Check out the merchandise page for info on buying the DVD. There are also 3 new photos in the candids gallery - the three bottom ones. Already sold out for Nov 24th StuntLab, we are now selling fast for the 25th of Nov as well. Come and join in the fun, firearms fight choreo and wire flying adventure. Get your fix until we run our big SOHK class in the spring of '13!! Check details below at the "2012 February 15" entry. See more details on the convention page. Keep an eye on the convention page - there might soon be news for European fans. Come down and join us for a day of fights, filming, insight and flying into a crash mat! Where: Shoreline Studios, Vancouver, British Columbia, Canada. Click the mini-posters to read the details. Get ready for another semester at "The School of Hard Knocks" - the 3 week course takes place various Vancouver locales in March/April. 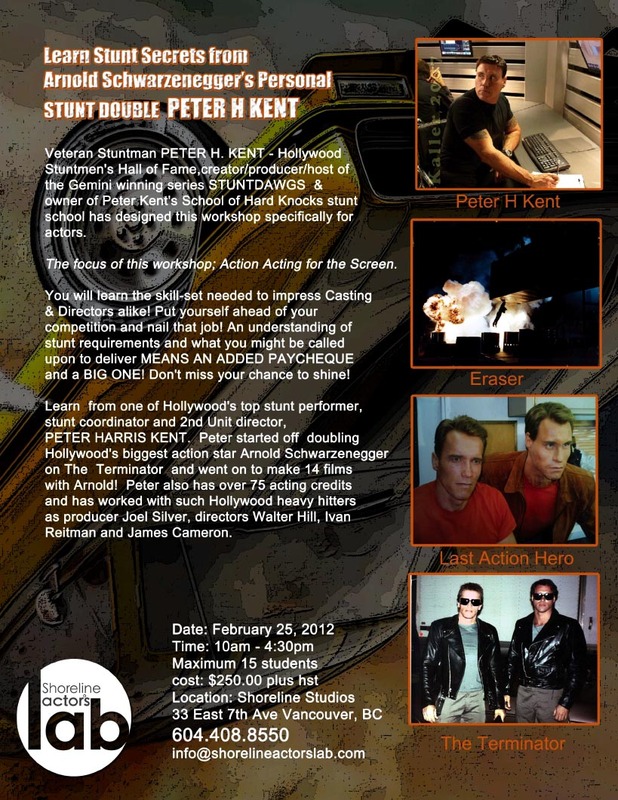 Check the Stunt School Page for details. Great News: Peter is on the JJ Abrams TV Series "Alcatraz" again! Yeah, once you've been in prison, there is a pretty good chance you end up behind bars again. In the cold January rain Peter had his share of fun returning as prisoner #1 - who hopefully will get a real name soon... Now we only have to keep our fingers crossed that Peter will turn into a real TV- jailbird and come back for another episode! 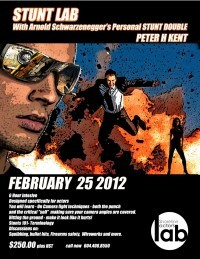 So JJ Abrams if you read this, we want Peter H. Kent back on your show! "Alcatraz" starts airing early summer 2012, we'll keep you updated! Mark Miller was set on fire on Discovery.ca - of course strictly supervised by the stunt school instructors - the link opens in a new window. Added a trailer for the movie 'Race to the Finish' that Peter co-wrote, co-directed, co-produced and acted in. Keep an eye out for more upcoming interviews ... Newsweek for instance. Next School of Hard Knocks starts October 28. October 07, 2011 Peter will start shooting the movie RACE TO THE FINISH in Buffalo, NY, USA. He co-wrote the script and is 2nd unit director as well. It is a story about the bullying of children at school, on the way home, etc... Rumor has it he will also play a little part in front of the camera. Site updates: Added two new headshots, added a clip from ETC on the video page and added a bunch of links on the media page. There's a new resume in town! And happy news! Peter has a role in the new JJ Abrams TV series "Alcatraz". Keep your fingers crossed that it will be a recurring role! Besides, the role as prisoner #1 is quite a step up from thug #7. Check the Stunt School page for details. Old news: Sadly CHAOS didn't go to series. The guestbook is now online Entries won't show up until they have been approved by Admin. Email addresses won't be visible. Old news - but better late than never! One of Peter's stunts was listed on CNN's The Screening Room's Top Ten Stunts. And the accent will be Bavarian, just like Arnies. Added a Projects page - yes, yes, the galleries ARE coming soon! First pages of PeterHKent.com online.